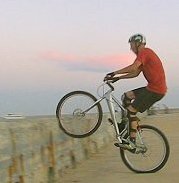 Even for low obstacles, bouncing the front wheel really lifts the bike upwards and makes the climbing much easier and effortless compared to pulling a bunny hop or a simple pedal hop. 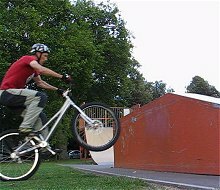 It is a pedal hop technique, but with the extra complication of hitting the wall edge with the front wheel (lose) during the acceleration of the pedal kick. 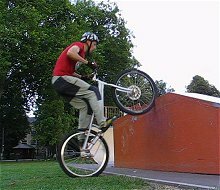 This technique can be used for very high stuff, bouncing-rolling the front wheel even below the full height of the obstacle. It requires much less run-up distance than a bunny hop (about a crank turn minimum) and offers much more control. This technique is a good alternative to the rollover if you want to climb on a sharp edge with nothing behind. 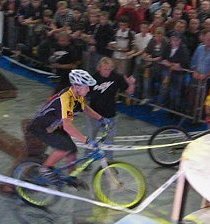 1° In the last crank turn, lift the front wheel when pushing on the goofy pedal (left if you are right-foot forward) to get the wheel up towards the edge of the obstacle. 2° Stay focused, and aim your front wheel right at the top edge or one inch below, finish the crank turn with a good kick on the right pedal to bang the front wheel upwards. 3° Resist the impact by firming up your arms, to achieve maximum tyre compression while the front wheel hits the edge. Both tyres get compressed. 4° During compression, give the maximum jump extension from the highest position on the pedals. 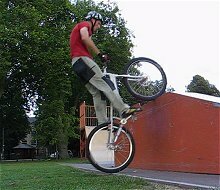 The front wheel will roll up against the edge. 5° The front wheel stays lose, pull up the bike with you while you tuck just after the jump extension. That is what brings the rear wheel up. 6° Tuck as much as you can to get the rear wheel onto the edge that you just hit with the front wheel. Block the rear brake to secure your grip. This looks like riding up a virtual steep slope that starts on the ground where the rear wheel touches and passes-by the edge where the front wheel bangs. Well, it is really difficult to get everything right at the same time. 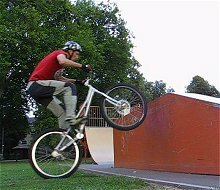 This move requires very good timing and very good positioning of the bike before take off, so adjust your marks before you start, count your pedal strokes to reach the wall with your good foot forward. Ideally, the front wheel just hits and roll off the edge (no braking on the front wheel). 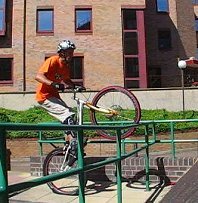 The trick is to synchronise the extension and jump impulse on the pedal with the wheel bang. 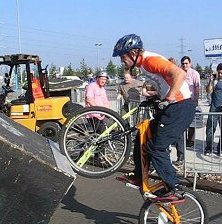 When the front wheel hits the edge or below, both tyres are compressed, and during a fraction of a second, you can really give the maximum jump extension onto the pedal kick with good support from the ground. The instant after this compression, the tyres spring up and boost the move upwards, while you pull the bike up with you. This works on rails, hit them right. Hit it hard right on the edge or below. 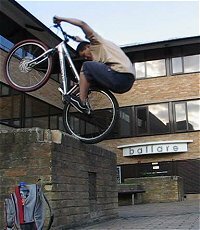 Focus on aiming your front wheel at the edge is key. If the edge is too sharp, the hit too frontal, or the pressure in the tyre too low, you can pinch your front tyre flat. 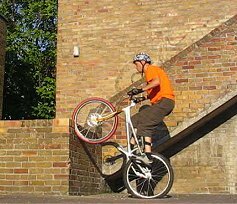 The front wheel tapping or banging technique will definitely bring another form of abuse to your bike. 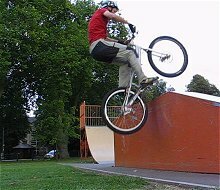 Even when fairly well mastered, this technique will eventually break any fork, and has an excellent potential to buckle many wheels. You can narrow down the section of the obstacle you hit to an horizontal line, and use this on rails or very precise edges. Though there is typically a mental block to surmount, and the move is harder to visualise. But once you know your marks very well, trust yourself and give it a go. 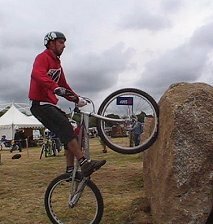 Experienced riders are able to hit the front wheel on the most awkward corners or narrow edges, even tapping completely below the edge if there is some flat surface to hit and the obstacle is too high. This technique also becomes more difficult as you have less run-up distance. This requires power and precision at the same time.